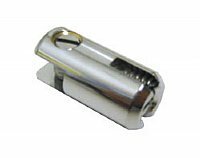 Used on cable kits to hold glass or acrylic shelves. 4 required for each shelf. Polished chrome finish. Grips upto 6mm panels.